TAMPA, Fla., March 26, 2018 /PRNewswire-USNewswire/ -- Mike DeLancey enjoyed an active life before joining the Marine Corps. On Sept. 1, 2006, a sniper's bullet changed everything, severing his spine and paralyzing the 21-year-old. Two years later, Mike connected with an organization looking to help his healing. 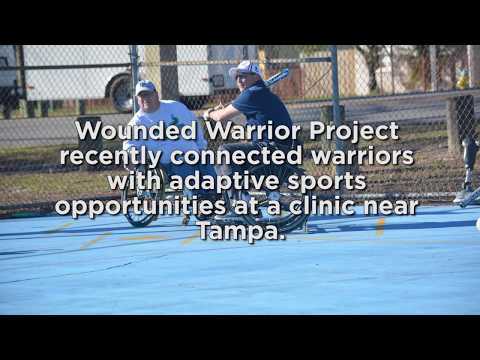 Wounded Warrior Project brought veterans to learn about adaptive sports at a recent clinic near Tampa. "Wounded Warrior Project has helped me tremendously since I got involved in 2009. They've helped my family, they got me involved in different activities like this, and they and got me out of the house and motivated to be active." The Wounded Warrior Project® (WWP) Independence Program has helped Mike deal with the stress of recovery. Along with helping Mike adapt to his new normal, WWP also provided opportunities for Mike's caregiver, his dad. Mike enjoyed getting involved at a recent WWP adaptive sports clinic in Tampa. Over two days, Mike and other wounded veterans learned about adaptive physical activities – tennis, softball, sled hockey, and basketball. "I really liked hockey and softball yesterday, basketball I still am trying to get. Hockey we learned coordination, little tricks to move the puck. At first it is kind of difficult, but when they show you how, it makes it easier." Not only did Mike learn about the different sports, he connected with other warriors who face the same challenges he does. He also learned about organizations near his home that do these activities on a regular basis. "I'm definitely going to pursue softball and may try sled hockey again." During the clinic, WWP informed warriors about the adaptive equipment available to them, and how the Department of Veterans Affairs (VA) will help cover the costs in some cases. Warriors heard from a VA representative about the steps needed to qualify for adaptive equipment for sports. More importantly, these clinics reminded warriors they can be active in their community. "This is empowering me by showing me I can do the sports I loved and enjoyed before I got hurt."